Kesia Nagata is a BC-based singer-songwriter living on Gitxsan territory. 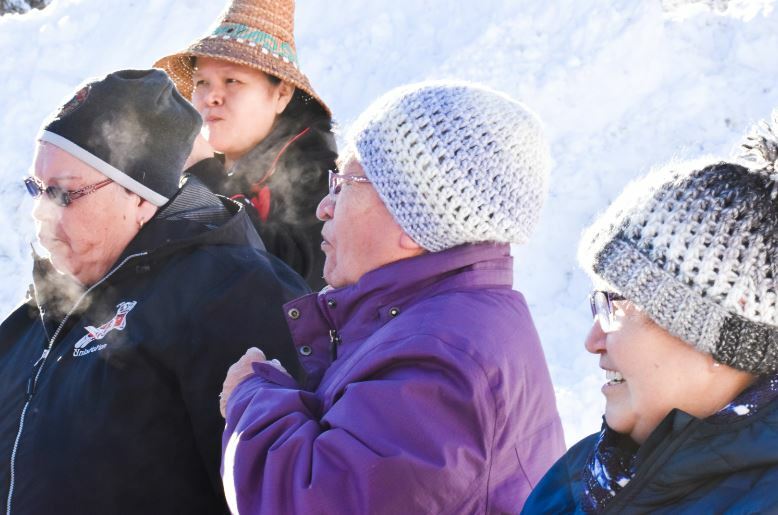 As a community organizer and ally, she works with Hereditary Chiefs on projects they design to increase the security and sovereignty of their food and energy supplies. 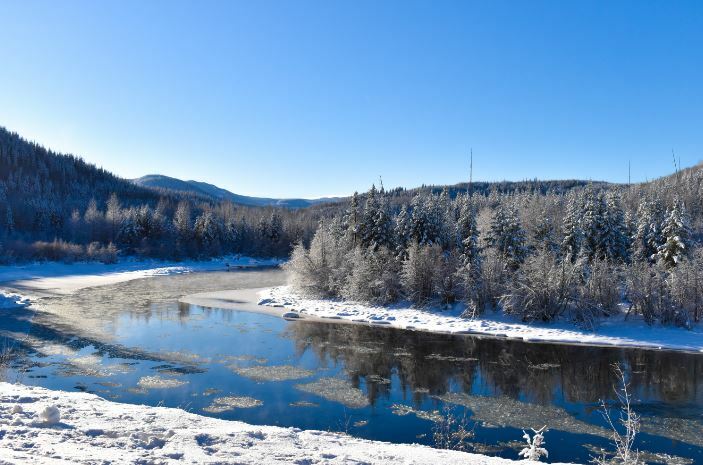 Kesia recounts some of her experiences over three days in early January witnessing Wet’suwet’en land defence, as police force was used to raid and enter the Unist’ot’en and Gidimt’en checkpoints to make way for Coastal GasLink fracked gas pipeline work. 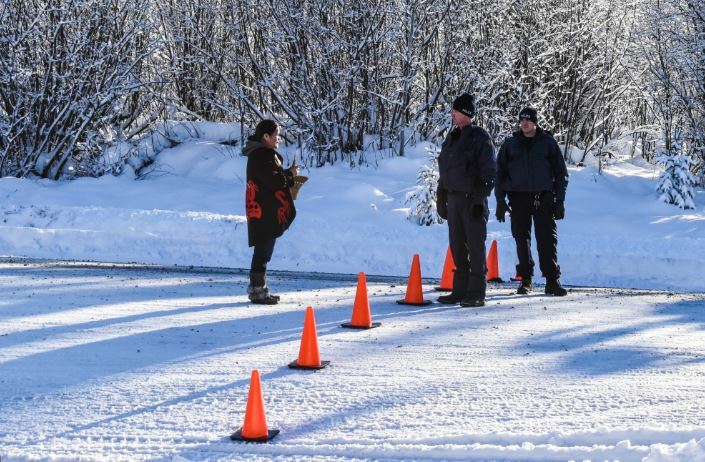 These vignettes are from a small camp set up by supporters at Kilometre Marker 27 where the RCMP blocked further access to the Unist’ot’en camp and community in northern BC. All photos are by Kesia. It’s a five hour round trip for me to wait outside the orange cone line patrolled by BC’s most friendly policemen, in snow or in 20 below. The makeshift camp, now features a permanent campfire and a wall tent, wood stove and propane cooker perpetually warming soups and chili. 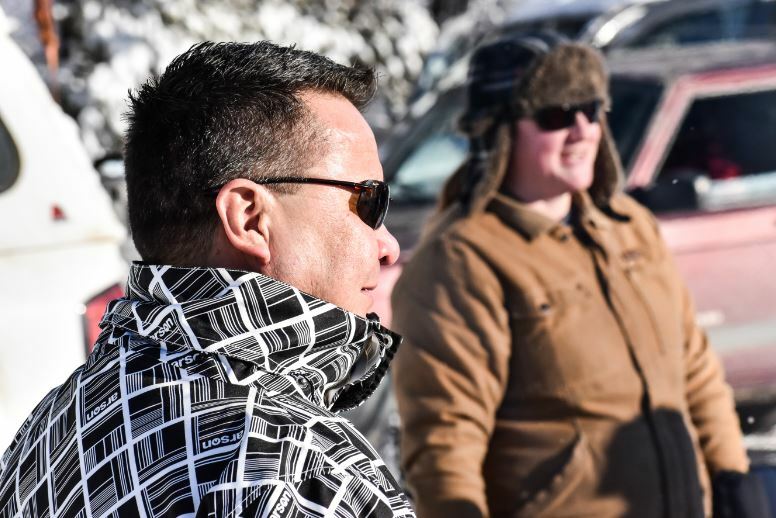 This sprang up virtually the second would-be supporters realized they were barred from accessing the Unist’ot’en and Gidimt’en camps where their families, friends, house-group members, and constituents waited for militarized police forces to arrive. 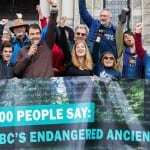 Matriarchs and Hereditary Chiefs, representatives from the Office of the Wet’suwet’en, members and chiefs of the neighbouring Gitxsan nation, the mayor of Smithers, the MP for Skeena-Bulkley, reporters from CBC, the Star, APTN, concerned residents, a guy named Rodney from Cortes Island, farmers, musicians, activists from out east and down south, kids, moms – sitting fireside is a veritable cross section of northern BC, and everybody is getting along just fine, drinking from actual tanks of Tim Hortons coffee. When I take off my boots to dry my socks, Rodney offers me a new pair for keeps. The culture at 27 is a quiet one. There is no cell service and no contact with the outside world. There is no official purpose, except an unspoken agreement to witness, and to wait. 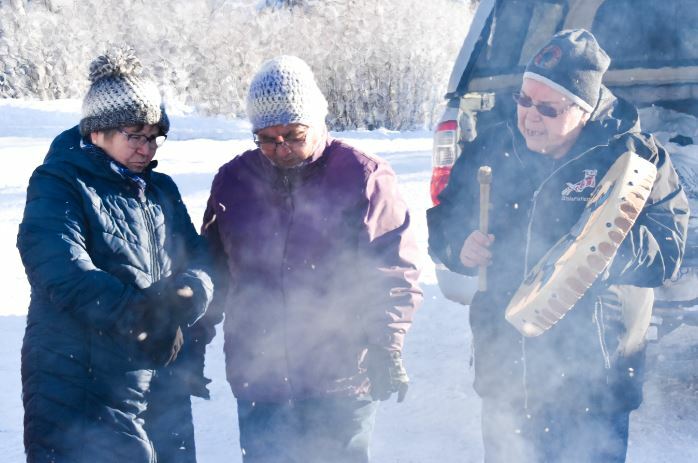 The more senior police officers mingle with everyone else, sheepishly inching closer to the fire, and while most ignore them unless asking for information, many people – especially, I notice, Wet’suwet’en women – go out of their way to talk to them. “This is my home,” they tell them, bright eyed and smiling. “Welcome to Wet’suwet’en Territory. It’s such a shame you’re keeping me from visiting some of my favourite places. This pipeline you’re helping them build? It’s going to destroy our precious way of life. I won’t be able to teach my kids what my parents and grandparents taught me.” And then they bump up shoulder to shoulder with the guy to scroll through their phone snaps and show them all the beauty that is at risk, smiling and chatting the whole time. Sometimes the cops pull out their own phones to show off their own favourite landscapes. We’re quiet and unaware during the raid on Gidimt’en, with no knowledge of what’s actually happening 17 kilometers west of us. Many of us believed the injunction gave defenders until the 10th to surrender, and aren’t expecting violence today. Others are tense and quiet, knowing something is going on that these approachable, obfuscating policemen won’t tell us. Later we will hear from an eye witness who managed to escape arrest about how the women held the line, linked arm in arm and singing, speaking directly to the armed police officers: “Don’t you understand that we love you? We’re doing this for you, for all of us.” We hear of how they reminded the Aboriginal Liaison Officers of the perpetuation of violence against indigenous women since colonization, of the violence and danger that the man camps Coastal GasLink plans to establish will present to them. 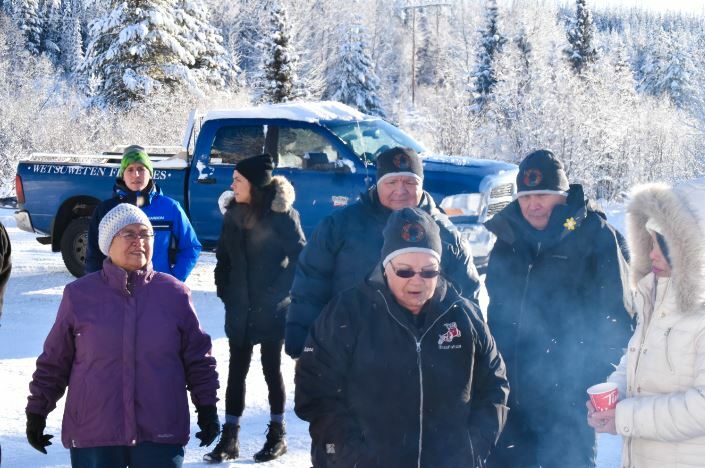 We hear of how that Liaison team promised to keep the peace while Coastal GasLink removed the obstructions, but instead allowed their fellow RCMP officers, many dressed as tactical soldiers and wielding fully automatic weapons, to threaten these same women. When I watch Molly Wickham’s account the night she is released, something in me that has remained removed and stoic shifts. For some reason, it is the part where they came at them with chainsaws that sticks in me and breaks me open. I’m holding my phone and watching the video and crying in the bathroom as Molly remembers. I’m realizing some part of what it might have felt like, not knowing where the line was for those men. Not knowing what their orders were, no longer trusting that they wouldn’t dare hurt you. Not knowing how afraid to be, or not be, and so finding yourself terrified. For the rest of the day, in quiet moments, I imagine men in uniform advancing with chainsaws and blank expressions. The non-Indigenous grandmother who was arrested and then immediately released makes it clear that she was treated better than other women there, maybe in part due to her age, but most likely due to the colour of her skin. The others have not yet been released, and nobody’s sure if they’re in Houston or Prince George, or what it will take to get them out. I am not Indigenous to North America, but with my long dark hair and half-Asian eyes, I have often been mistaken as such. Where would I be now if I had been on that line? I am a newcomer here. My family was drawn to the North for many reasons, not least of which was the incredible strength we recognize in the Wet’suwet’en, the Gitxsan (whose territory we live on), and the nearby Tahltan who have all fought incredible battles on the ground and in the courts to maintain their right to govern and manage their people and territories according to traditional law and hereditary leadership. 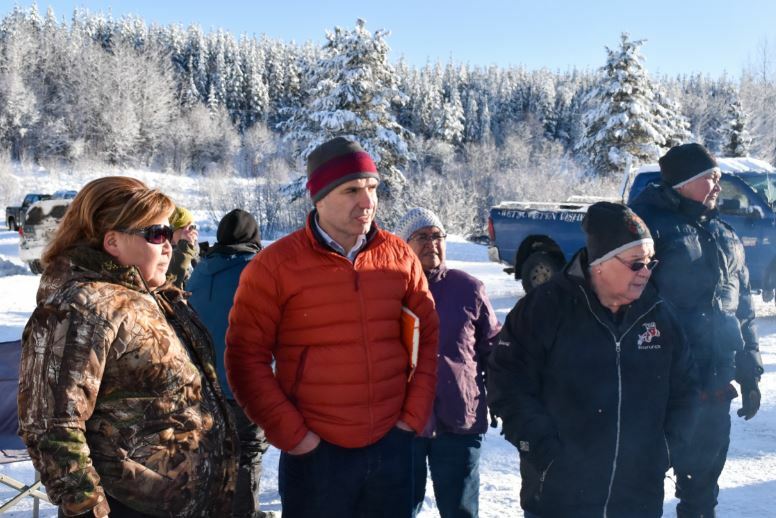 As a community organizer, I work with Hereditary Chiefs on projects they design to increase the security and sovereignty of their food and energy supplies. And walking or driving with them over these seemingly endless northern landscapes, running my fingers across maps of the territories tacked to office walls, hearing the names of Chiefs and territories and mountains and rivers and asking to hear them again and again until some of them stick in my memory, I begin to realize that nothing – absolutely nothing – is not accounted for. Now when I drive, I watch for the landmarks that tell me I’ve crossed into the next Lax’yip or Yintah. 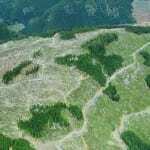 There is no such thing as wilderness, as Crown Land, as the Wild West. It’s all someone’s, and that someone has tended to it since time immemorial. This is a truly basic realization, but as an amsiwaa or non-Indigenous person it colours in a blank map with vivid images. It makes me step more carefully everywhere I go, so as not to disturb someone else’s space. My friend tells me that the chiefs used to know their own territories so well, that when a moose walked across it their hair would stand on end. I’m paying attention to cognitive dissonance on three different levels. There are the cops at 27, presenting as Nice Guys but going stony-faced and combative when asked why they are supporting such a god-awful project – they say over and over like a mantra keeping their skin together that they’re doing their jobs. 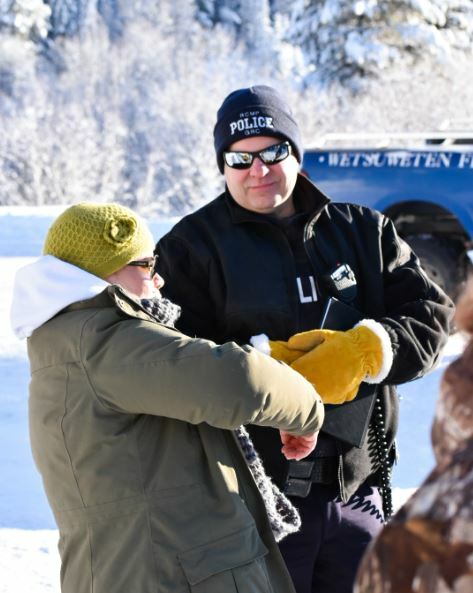 Then the RCMP at Gidimt’en, promising a controlled process and instead delivering chaos, forcibly removing First Nations people from their own land yet again. And then the provincial and federal governments preaching UNDRIP and reconciliation while ramming through unceded Indigenous land with cold blatant force, turning those sworn to “serve and protect” into a corporate militia. How long, I wonder, can a person or institution say one thing and do another before self-destructing?